In Giselle, the Wili’s glitter and dance with joy over the bodies of their male victims. Valerie’s manifesto bristles with anger and a lust for violence from start to finish. There’s anger and savagery at work in Scum Ballet too, except it’s not red like Valerie’s, but more silvery in tone. It’s not a thickly coiled serpent; it feels thinner and steadier than this, like the looping sound of a needle digging into the groove at the end of a record. It’s still warm, but without the flush. It’s a rage that is luminous, almost transparent; there’s a lightness to it, which causes it to float, unmoored, and unstuck. Scum Ballet is made up of a collection of distinctive scenes, each with their own set of actions. 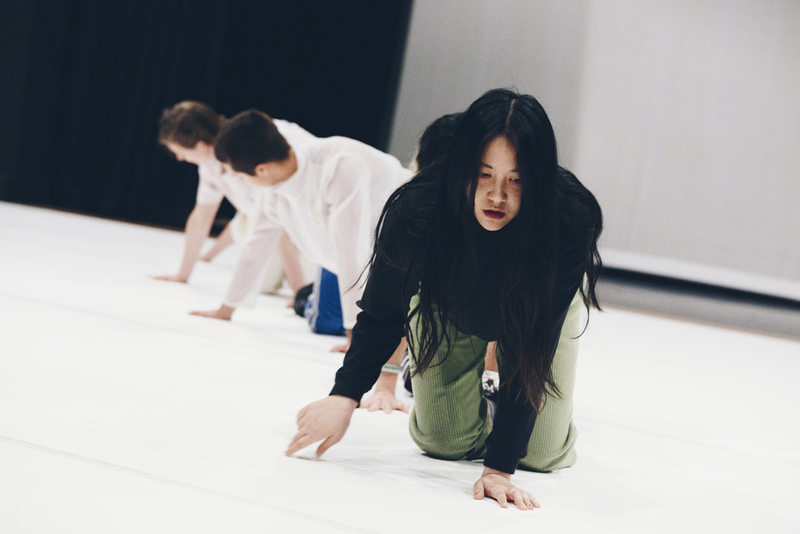 Movements are mostly slow – at times, achingly so: heels and toes are purposely placed when walking across the paired-back stage, outstretched arms make their glacial way to positions above the head, there’s a lengthy panther-like saunter on all fours. This sense of watchfulness, of marking out territory, is underpinned by gestures of vulnerability and gentleness – early on, a dancer’s head is nestled delicately into the crook of another’s neck, and later, small blue knives are dragged softly and with tenderness across their exposed skin. It’s an exquisitely creepy collapse between the threat of violence and its opposite, love and care. Is this gang made up of friend or foe? Is the equilibrium that exists between them fragile enough to break? Throughout the piece there are seamless shifts between the group and the individual, between dissonance and subsequent alignment. This is testament to Angela’s strength as a choreographer, but also to the relationship developed between the five dancers. They never once flinch or buckle. An example: Angela walks (slowly, heel then toe) towards the kneeling Ivey and Verity, who are gently sliding a wooden board with a felt underside across the stage. As Angela walks onto the board, Ivey and Verity must account for this new weight pushing against them, they must double their effort and strength, and yet, they continue onward, slowly and delicately, without pause. 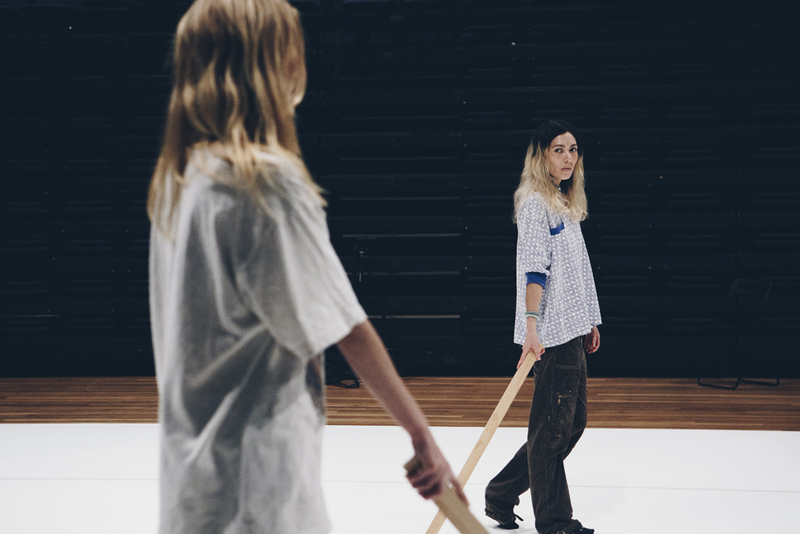 In another scene, Verity and Angela circle each other in the centre of the stage, each carrying a wooden plank by their side, its bottom edge sliding against the surface of the floor. They maintain eye contact just as an electronic remix shudders and erupts out of speakers. A disconcerting space opens up between the heavy bass and the inevitable rush of adrenaline that comes with it, and the pulled weapon that never once leaves the ground. There is one palpable moment of relief from the sustained tension, when the dancers commune together, flinging, smashing and pulsing their bodies in time with the thumping beat. It’s a kind of ritualistic frenzy – I imagine this is how the Wili’s felt when they got hold of their prey – and the boundaries between pleasure and violence, between freedom and constraint are indistinct. I thought of Lady Macbeth with the blood on her hands; I thought of Bertha in Jane Eyre, hidden in the attic. It occurs to me that all this both is and isn’t for the audience. The energy of this coven, and the productive ‘force’ of movement that Angela refers to, lies in the incantations and swapping of spirit between the dancing bodies. The audience can only be a sideline witness to this: we are privy to glimpses of their power rather than the full apprehension of it – this remains closed off, open only to those who have entered the ringed circle of the group. Author’s note: all quoted text taken from the artist statement in the Campbelltown Arts Centre printed program, ‘Scum Ballet’ (2017).